I decided to cook some red meat this week. I’m one of those people who need some animal protein – red meat in particular – to feel “all-there.” My body just doesn’t seem to absorb iron from plants efficiently. Whatever the reason, I get horribly iron-deficient. Dark under-eye circles. Fatigue. Headaches. Muscle aches. A whole gamut of symptoms I won’t bore you with. I just eat a little of red meat once a week for a few weeks. And voilà. Symptoms gone. 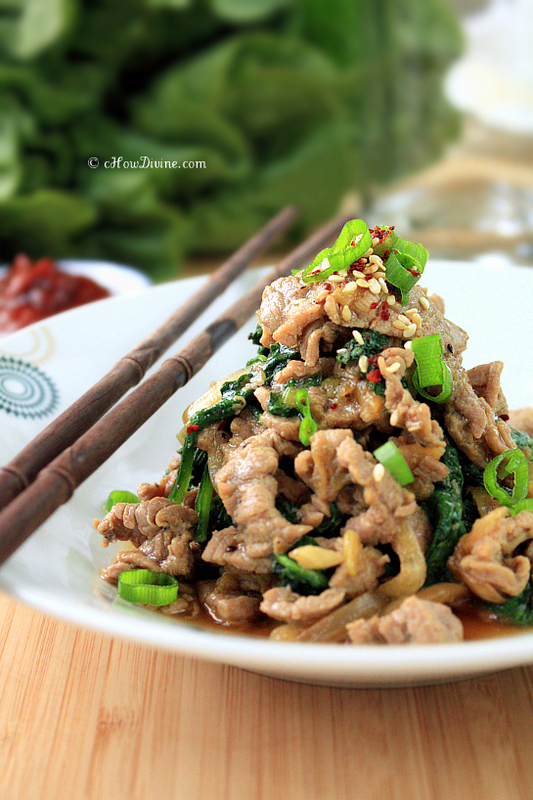 To ease the symptoms, I made some bulgogi with wilted spinach this week. I felt bad, because my husband is on a strict eating program for the next two months for his psoriasis. I knew he wouldn’t be able to resist taking a nibble or two… or ten. So I tried to make it as lean and healthy as possible. For starters, I decided to add some spinach. And I bought grass-fed beef since it is much higher in beneficial omega-3 fats than its grain-fed counterpart. Additionally, I bought the leanest cut the butcher had available – the eye round. The butcher warned me when I got it that “it will turn tough as leather if [I didn’t] eat it pretty rare or braised.” I know. 🙂 I’ve made bulgogi with this cut plenty of times. No worries. You just have to make sure that the meat is cut as thin as possible against the grain. Partially freezing the meat goes a long way in achieving a paper-thin cut. Additionally, I add a small amount of kiwi to the marinade. Kiwi is rich in a protein-dissolving enzyme called actinidin, which helps tenderize the meat. Place the beef in the freezer for about 1-2 hours until the beef is partially frozen. Once partially frozen, slice the beef against the grain as thin as possible. Add tamari, sesame oil, minced garlic, agave nectar (honey or sugar), mirin, and pepper into a bowl. Mix well. Add the blended kiwi to the mixture. Mix well. Add the thinly-sliced beef into a large mixing bowl. Pour the prepared marinade from step 2 over the beef. Mix well using your hands to massage the meat. Add sliced onion to the meat. Mix. Cover tightly. Marinate for at least 1 hour (up to 12 hours) in the refrigerator. Heat a pan or a skillet on moderately high heat. Add just enough oil to coat the pan/skillet. 1-2 tsp of oil will do. Add the marinated beef to the pan/skillet and stir-fry. Don’t overcrowd the pan. Cook in batches if necessary. On moderately high heat, the meat should cook very quickly within a minute or two. Once the beef is cooked through, add a BIG handful of spinach into the pan. Stir quickly. Remove from heat. The spinch will wilt from the heat of the pan. Garnish with chopped scallions and/or toasted sesame seeds if desired. Serve hot with rice. You don’t want to completely freeze the meat. If you do, you will end up with a powdery mess when attempting to get a super-thin slice. Do NOT marinate this more than the recommended time. You probably can get away with refrigerating it for a day, but it will turn into a GRAINY MUSH if you leave it longer. I did a little experiment and left it for about 3 days in the fridge. Wow. It turned into a grainy mess. You may not see it when it’s raw. But when you try to cook it, it will just break down into mush. Kiwi is very effective in dissolving proteins! If you are using a tender cut of meat, like rib eye or tenderloin, do NOT use kiwi. For this dish, you are NOT trying to brown the meat. Cook it until it’s JUST cooked through. You will end up drying out the beef due to the lean cut and the thinness of the beef. There will be some broth that will form in your pan. That is fine. That broth is delicious when poured over rice. WOW! I absolutely love this recipe! The pureed kiwi was quite a surprised to see, but I bet it imparts a wonderful flavor! Like you, I need some red meat about once a week and this is a wonderful way to get it. Thanks for another fabulous recipe! Hope you’re having a great weekend! Thank you MJ! Kiwi does wonders for the texture of a pretty lean/tough cut of meat, and the subtle flavor it imparts is a bonus. I guess some of us are just meant to be omnivores! :) Hope you are well! I love the way you used kiwi here. I remember our Korean neighbour (sadly they lived here only for a year… but I profited a lot in terms of food discovery!) would often add European pears to her dishes. Iron deficiency is no joke, right? It really puts me through the wringer! I’ve never had black pudding. I don’t know if I can get myself to try it. I’m a wuss when it comes to certain foods. :D Kiwi is a great tenderizer. But if I can find Korean pears at the market, I always put them in my marinades. They are wonderful in marinades. Bulgogi is pretty tasty either way tho. I guess I’m like your husband. I’m a total beef person! Hope you are having a lovely weekend! I’m totally craving some. It’s late night again and I am hungry..surprise surprise lol. I don’t think I have any beef in my fridge at the moment, or I’d totally be making this. Hmmm….what to eat?! I never knew that kiwi was a tenderizer – great tip. And great recipe. I’ve eaten this before, but never made it. It’s so easy to make! I gotta try this – thanks so much. It’s a great tenderizer with a little bit of sweetness. It’s a must whenever I cook a leaner cut of beef that I’m not braising. 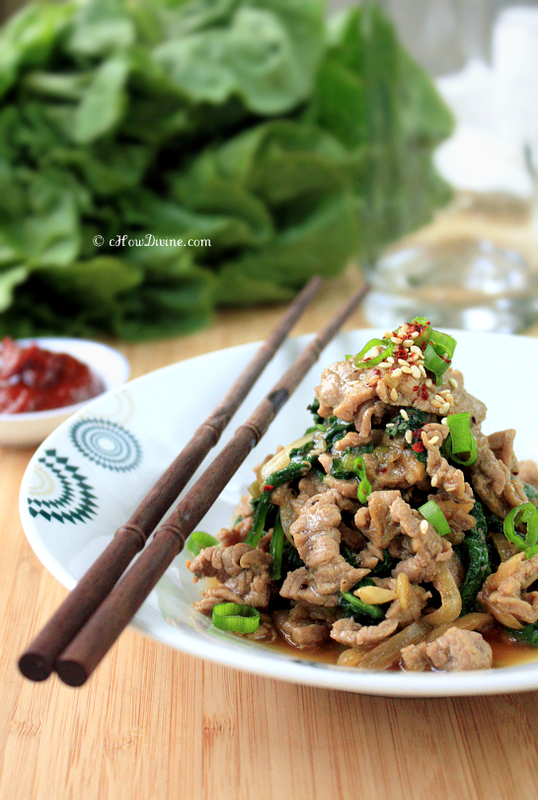 Bulgogi is very easy to make. You should really try to make it at home. It’s great, because you can adjust the flavors to your liking. Hope you are well! Thanks Sandra! The kiwi works really well! It’s a great way to enjoy lean cuts of beef. I hope you give it a try. Hope you had a wonderful weekend! A great way to use up spinach – thanks! What a nice simple meal and yet so full of flavour! Thanks Yvonne! Kiwi is my go-to ingredient when I’m using a leaner cut of meat. I hope you give it a try!